Athlete of the month! Mr. February! Way to go Brian. 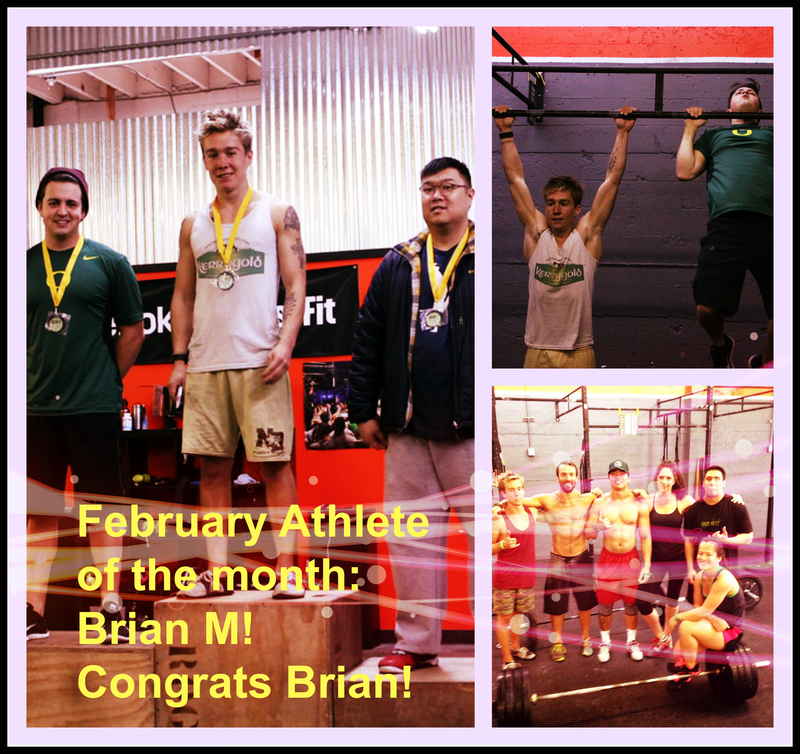 It’s hard to choose only one athlete but you can all agree that Brian has earned it. Brian is committed, has seen a lot gains in performance and all over fitness. We are impressed! Brian M is outstanding and excellent to have in our community and in our classes. He is often calm, smiling and willing to help others out around him. If you have not worked out with Brian yet, catch a class with him in the evenings at 5:30pm or 6:30pm and Sundays in Oly and team. I started doing Crossfit consistently last March. In the past I’d dabbled in Crossfit a bit but I kept moving around so I wouldn’t ever stick with it for more than a couple months. But I liked the intensity and the communal aspects of it. Once I moved to Portland permanently I knew I wanted to start going to a Crossfit gym consistently and CFSWP has been perfect for that. Anything with doubleunders and/or rowing. I’m a freelance video editor/videographer, which is nice because I can set my own hours and thus don’t have much excuse not to get a workout in. I love the Oregon Ducks, making music, and learning about nutrition. I have a sort of “second life” over in Sierra Leone where I go about once a year and help out this gang by making music videos for them. Before Crossfit I went through this phase where I got really into running and ate a vegan diet. I got super skinny and probably harmed my overall health. Now I eat a lot of steak and eggs. I definitely feel stronger and healthier now. Wow I’m not as strong as I thought I was. What were your goals when joining CrossFit? Have you achieved any of those goals? Current goals? I didn’t have any specific goals when I joined, other than to become fitter/stronger than I had been in the past. I think I’ve probably achieved that. My current goals are now to become a competitive obstacle course racer in 2015 and to do this thing in the summer called Kokoro Camp where you pay a bunch of money to get tortured for 50 straight hours by Navy Seals. Yeah, when you challenge yourself and make yourself uncomfortable on a regular basis with something like Crossfit you become less afraid of taking on more challenges. In that way I think it’s made me mentally tougher, more “stoic” in my life outside the gym. What advice would you give to a newbie just joining CrossFit SW Portland? Stick with it. It won’t ever get easier, but you’ll get stronger.